FRANKLIN, TN: Dog food brand Pedigree launched an awareness campaign to coincide with the upcoming Paramount Pictures' film Hotel for Dogs. 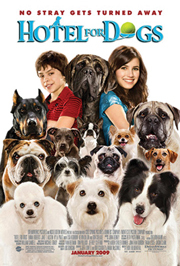 FRANKLIN, TN: Dog food brand Pedigree launched an awareness campaign to coincide with the upcoming Paramount Pictures' film Hotel for Dogs. Employing the message of, “See the movie. Help a dog,” the campaign is reaching out to educate consumers about the number of dogs that are in need of homes, aligning it with past Pedigree efforts as well as its brand values. Pedigree's Chicago-based AOR Weber Shandwick (WS) and the internal team at Paramount are handling outreach to national lifestyle media leading up to the movie's premiere on January 16, in an effort to “reach everyone who is a dog lover,” Fair said. Pedigree and WS worked closely with Paramount for media relations, Menaker said, bringing their pet industry contacts to combine with the studio's entertainment contacts. A representative from Paramount, who declined to be named, told PRWeek that several dog and pet publications have covered the movie so far, including a cover story in Dogs for Kids. The source added that the stars of the movie, including Emma Roberts and Lisa Kudrow, are also discussing the partnership in interviews and at the press junket. Pedigree plans to offer information about pet adoption and the Pedigree Foundation, as well as the recipient of the donations, at the film's press junket starting on January 8. The nonprofit foundation supported more than 600 shelters in 2008, Fair said. The campaign's message will appear in marketing materials for the film and for Pedigree, including in-store signage, popcorn tubs, and TV spots. Pedigree also launched a microsite for the effort, and plans to take part in the Los Angeles premiere January 15 and at a special screening in Nashville.